The Donor (called a Grantor in Saskatchewan) is the person who is granting the powers. Each person whom the Donor is granting powers to is called an Attorney. If you choose two, they can make decisions "jointly" (MUST have consent of other Attorney) or "jointly and independently" (do not require consent of the other Attorney to make decisions). How many Attorneys do you wish to have? If your Attorney(s) are unwilling or unable to exercise their powers, the Alternate Attorney(s) will be able to exercise them. Do you wish to name any Alternate Attorneys? How many Alternate Attorneys do you wish to name? Do you wish your Attorney(s) to be compensated? An Enduring (or Continuing, in Ontario) Power of Attorney will remain effective if you lose mental capacity. It can come into effect immediately, or only once you become incapacitated. A non-Enduring Power of Attorney will automatically end upon your incapacitation, or at a time you specify. Do you wish to create an Enduring Power of Attorney (one that will remain effective if you become incapacitated)? How many powers will be immediate? Enter your description so it begins the sentence: [description] will be conclusive proof of my incapacity. Giving a "general power" means giving your Attorney the authority to do anything you could otherwise do, if personally present. However, in most provinces, this does NOT include the power to manage real estate. If your Attorney will be managing real estate, select this option from the list of specific powers. Do you wish your Attorney(s) to have a general power? Do you wish your Attorney(s) to have specific powers? Do you wish your Attorney to prepare financial reports? Do you wish to restrict the powers of your Attorney? In Alberta, your Power of Attorney MUST be signed in front of one witness to be valid. The witness cannot be the Attorney, or a spouse or partner of the Attorney or the Donor. To make your document more acceptable at financial institutions and other organizations, we highly recommend the presence of a Notary Public or Commissioner of Oaths. Please choose the appropriate options below. In Saskatchwan, your Power of Attorney MUST be witnessed by a lawyer OR two witnesses. The witnesses must be adults, and cannot be the Attorney, or a spouse of the Attorney or the Grantor. To make your document more acceptable at financial institutions and other organizations, we highly recommend the presence of a Notary Public or Commissioner of Oaths. Please choose the appropriate options below (if a lawyer will be witnessing this document, select that you WOULD like a certificate of legal advice). 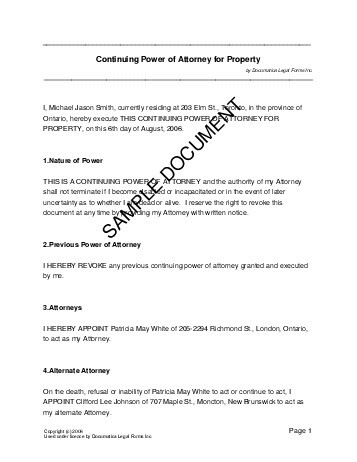 In Manitoba, your Power of Attorney MUST be signed in front of a Notary Public and one witness to be valid. The witness cannot be your Attorney or his/her spouse. Please choose the appropriate options below. In New Brunswick, your Power of Attorney MUST be signed in front of one witness (who is NOT your Attorney) to be valid. To make your document more acceptable at financial institutions and other organizations, we highly recommend the presence of a Notary Public or Commissioner of Oaths. Please choose the appropriate options below. In Prince Edward Island, your Power of Attorney MUST be signed in front of one witness (who is NOT your Attorney or your Attorney's spouse) to be valid. To make your document more acceptable at financial institutions and other organizations, we highly recommend the presence of a Notary Public or Commissioner of Oaths. Please choose the appropriate options below. In Newfoundland and Labrador, your Power of Attorney MUST be signed in front of one witness (who is NOT your Attorney or your Attorney�s spouse) to be valid. To make your document more acceptable at financial institutions and other organizations, we highly recommend the presence of a Notary Public or Commissioner of Oaths. Please choose the appropriate options below. In the Yukon Territory, your Power of Attorney MUST be accompanied by a certificate of legal advice signed by a lawyer (who cannot be your Attorney or his/her spouse). Please select this option below. To make your document more acceptable at financial institutions and other organizations, we highly recommend the presence of a Notary Public or Commissioner of Oaths. Finally, the Attorney(s) MUST acknowledge the appointment using the form that will print out automatically with your document. In the Northwest Territories, your Power of Attorney MUST be signed in front of one witness (who is NOT your Attorney or your Attorney's spouse) to be valid. To make your document more acceptable at financial institutions and other organizations, we highly recommend the presence of a Notary Public or Commissioner of Oaths. Please choose the appropriate options below. Do you wish to receive a notary acknowledgement? A Witness Certificate is signed by the witness(es), whereas an Affidavit of Execution must be sworn by the witness(es) before a Notary Public or Commissioner of Oaths. Do you wish to receive a certificate of independent legal advice? Below are some random samples we have created with Documatica. Please note that these documents reflect a certain set of answers, and it is very likely that the document you require is different. Do not rely on the templates below - create your own customized Power of Attorney with our webpage. For maximum legal protection, obtain a lawyer reviewed Power of Attorney directly from us.